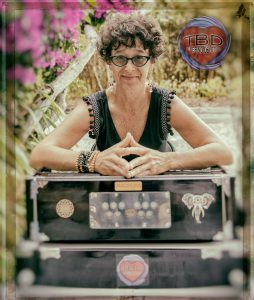 Join us for a night of Kirtan and live music on May 4th, as we are honored to host Dana Kaplan and her band; To Bring Devotion. To Bring Devotion is an Orlando based Kirtan band. Kirtan is an age-old practice of Bhakti Yoga, the yogic path of unconditional love. In this call & response form of musical chanting, our minds soften & focus, while our hearts open to the Divine light that resides within us all. The Names & mantras chanted carry great transformative, vibrational power. As Krishna Das says: “With chanting, the music is the syrup and the Divine Names are the medicine.” Dana Kaplan is the leader & co-founder of the band. Her rich, soulful voice will guide you deep into the practice. TBD’s dharma is to bring people together in love & joy. They beautifully blend Western rock & pop music with ancient, Eastern mantras. One of Dana’s favorite past-times is to “mash-up” positive rock/pop songs into her original music. TBD has been delighted to play at the Lovelight Music & Arts Festival for the last 3 years in Maryland. Most recently they played at the beautiful & intimate Goddess Rising: A Shakti Kirtan Celebration in Orlando, which Dana also produced. You may have also seen them at the Zen Awakening Festival and at the Faerie & Earth Festival, both in Florida, as well as at yoga studios throughout the Sunshine State. Although there will be no physical yoga during this evening, you may choose to chant, sing, sway, dance, or just breathe and enjoy. Floor seating available, but please feel free to bring a chair if you are more comfortable seated. Joining Dana is TBD band co-founder and bass player, Vick DeGiorgio; Richard Schooping on response vocals (Richard is the Harmonizer of the Heart); & Michael Himes on tabla/percussion.